The game comes with 52 pentomino plastic tiles, thirteen each in four different player colours and 40 game boards (four sets of ten identical boards in the player colours). Then there are 27 challenge cards, nine of each showing three, four or five different shaped pentominos, plus a scoring track and a 30 second sand timer. The plastic tiles are of good quality but the game boards, cards and scoring track are made of fairly thin coated card rather than being the thick cardboard tiles I had expected. I don't think it affects gameplay or how long they'll stand up to repeated play but it may come as a slight surprise based on the usual quality of Ravensburger's components. The game is played over ten rounds with players in each round using the same game board. Each board is rated 3,4 or 5 and this illustrates how many pentominos must be placed within a grid of multiple squares set out in a particular shape. Some of the squares in the grid also display a number. A challenge card of a number matching the board rating is turned over and this indicates which pentominos the players must use for this board. One player shouts "Go" and players try to fit all the pentominos into the grid, while trying not to cover number squares if they can. Once a player has done this, they shout out the sum of uncovered numbers in their grid and everyone else has 30 seconds to complete their grid but they are not allowed to leave the same sum of uncovered numbers as those players that manage to finish and shout their scores before them. Once time has run out, anyone who didn't complete their grid fails to score and everyone else scores the sum of their uncovered numbers. This is repeated over ten rounds and whoever then has the highest score is the winner. This is a pretty typical puzzle game and often there will be players that can easily visualise a solution and those that cannot. This makes for a dull experience for those that fall into the latter group. However, there is a catch up rule that I've not mentioned yet and this does help to level the playing field a bit. If, at the end of a round, you are ten or more points behind the leader's score, you get to use a smaller square tile as a replacement for an awkward shaped tile. This does make the puzzle quite a bit easier and can put the pressure on other players if you're able to quickly solve a grid. This ought to ensure people stay in reasonable contention throughout the game, although the more spatially aware players are still more likely to win. 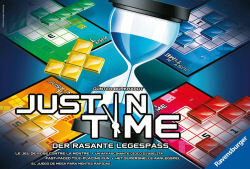 Just in Time is a good addition to the puzzle type game but it's not a great addition. There are other games I would probably choose before this, such as FITS or Take It Easy, but for those who are hooked on this type of game, it does make an interesting change and the race element does make it quite tense. It is a very straightforward game so easy to play with the family or occasional gamers. It's probably not one to play with hardened gamers though.